In a large mixing bowl combine 3 cups of the flour and the yeast. Warm 3 cups of milk and add the salt. Heat until the salt has dissolved. Don’t boil! Gently stir the wet mixture into the large mixing bowl with the flour and yeast. Using a large spoon, fold the mix together until all the milk has been added. Beat at low speed with an electric mixer for 30 seconds, scraping the sides of bowl constantly to ensure all the flour and yeast gets mixed in. Once the mix is thoroughly combined, beat at high speed for 3 minutes. By hand, stir in enough of the remaining flour into the mix to make a very stiff dough. on a large cookie sheet. Turn the dough out onto a lightly floured clean surface and knead until smooth and very elastic (about 15 minutes). Shape the kneaded dough into a ball. Place the dough ball in a large lightly greased bowl, turning the ball once to coat the entire surface. With a clean towel, cover the ball and let the dough rise in a warm place until it doubles in size (about 1½ hours). Punch the dough ball down and turn out onto a clean lightly floured surface (best turned out onto a cotton sheet lightly floured). Divide the large dough ball in ½ and set one half aside. Roll out one of the halves of dough to a 15×12 inch rectangle. 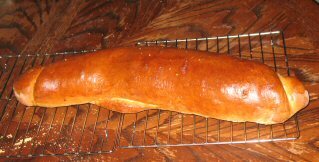 Beginning along the long side of the rectangle, roll the dough up tightly to form a long loaf. Place the seam down to form the bottom of the loaf. Use your fingers to turn the ends of the loaf under and press them to seal the loaf..
Repeat this step for the 2nd loaf (the other half of the dough you set aside). On the 2 lightly greased baking sheets, sprinkle a very small amount of cornmeal. Place each loaf diagonally, (one on each sheet), with the seam side down. Lightly cut diagonal slices into the top of bread loaves (about 2½ inches apart and ¼ inch down). Cover loaves with a clean hand towel over each and let the dough rise in a warm place until they double in size (about 1 to 2 hours; the longer you allow the loaf to rise, the fluffier it will be). When ready, place large oven safe shallow pan on the lower rack of the oven and carefully fill with hot water. If you have kids, give them a piece of the dough and let them make their very own Italian loaf. In a small bowl, combine 1 tblspn water to 1 egg yolk and mix thoroughly to make an egg-wash. 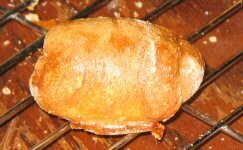 Using a basting brush, coat both loaves of bread over top and sides with the egg wash.
Place both loaves in the oven and Bake at 375° for about 20 minutes. Remove from the oven, brush both loaves again with egg-wash and return to the oven. Bake for about 20 minutes, keeping an eye on the loaves so they don’t burn. Place the loaves on a wire cooling rack and let stand for 10 minutes. Serve warm with butter and your favorite jelly or jam. * If the dough doesn’t rise after 1 ½ hours, something went wrong with the yeast and the bread is likely not to rise at all. Go ahead and make the rolls, but they’ll be thick and heavy instead of light and fluffy. To make a lighter loaf, use water or a 1% Milk. We use 2% milk in our house. Add any preferred seasoning to the egg wash to add a unique flavor to your bread loaf.